The Anchorage dating back to 1730 is Grade II listed for its architectural and historical interest. Nestling in the heart of the old artists and fishermen's quarter we are in easy reach of all beaches, restaurants and car parks. The Anchorage is open all year round Our four comfortable rooms are well equipped, including a TV and DVD player, free WI-FI access and most have en-suite facilities. Our breakfasts, which are served in the charming dining room, are made with the freshest Cornish ingredients where possible. St Ives is the ideal place to relax and unwind. Enjoy the often extended summer season on one of our many award winning beaches. Diving & fishing trips, pleasure cruises and surfing will suit most ages. Indulge at one of the many restaurants and pubs, serving the freshest seafood and local produce, fine wines and real ales. Parking: There is no on street parking available. Parking is available nearby at a charge of £12.00 per day. Very good staff. Asked for gluten free breakfast and that's what we got. Delicious and plenty of it. Hotel very cute and right in the heart of St. Ives. Wonderful location. We didn't need to move our car from the car park at all. Overall a great stay. Highly recommended. So much to do and see. We researched the area beforehand to find eateries and places to visit. No shortage of things to do. Fantastic and friendly B&B. Superb breakfast set us up for each day. Both Sian and Jackie friendly and knowledgeable. Would definitely stay again. Extremely friendly staff and excellent location. Would highly recommend. Wetherspoons is always a winner anywhere. Must have a drink in the iconic Sloop Inn and highly recommend the "Pasta and Pizza" Italian on the front for a lovely meal. TV was very high up the wall, viewing from a low angle makes the picture distort. would be better either lower, or able to be tilted down. Otherwise all great. Very comfortable stay in a plesant room with good facilties. The choice at breakafast was varied and we enjoyed the 3 we had. Tate St Ives for those who are interested in modern art ( and the view from the cafe superb). Porthmeor cafe 5 minutes walk away and on beach with beautiful views. Super easy check in, lovely place, really clean. Sian, the host, is wonderful and makes a great breakfast. Would definitely come back. Had a lovely stay, great location, good breakfasts. Great location and Sian was very welcoming and really helpful. Thanks for a lovely stay - will definitely be returning! Fantastic B&B in a great location. Wonderful breakfast & Sian is really friendly & helpful. There is no parking on site, although the B&B has a parking space that you can pay for in a nearby car park (about half a mile). If you're going to do this, I recommend using wheeled luggage, as it's quite steep to carry bags. Finding the B&B by car is very tricky, if you don't know St Ives, as the streets are very narrow & the one way system baffling. Take care in the B&B if you are tall, as there are loads of low beams, but I got used to it quite quickly. Bars & restaurants are excellent & we would recommend the Sloop Inn. 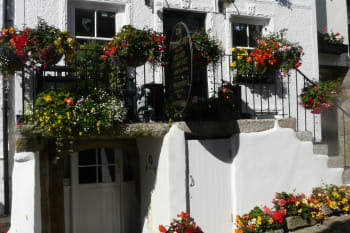 We loved our stay at The Anchorage, everything at your place set the tone for a quaint and wonderful stay in St. Ives. The hospitality and that hearty breakfast were tops. Sian, thanks for making arrangements for us. Walk the streets, soak in the atmosphere, go to the Tate. Visit the many art galleries, observe the architecture, the lanes and the unforgettable sea. Took many pictures with the hope of focusing on saescape painting when I return home to America. This was our second stay at The Anchorage this time with different owners but on both occasions the stay was very comfortable and welcoming. Excellent location and lovely breakfast would recommend this B&B without a doubt! Balancing Eel for good old fish and chips we also tried the new Thai restaurant on the front which we enjoyed great food! Lovely B &B, great location just steps away from the Main Street, although very quiet. Friendly staff serve a good breakfast. I would prefer to pick my breakfast on the morning rather than need to choose the night before. Would definitely recommend and stay again. very lovely place & stuff and located perfectly. enjoyed our stay very much! We enjoyed two lovely meals at the Seafood Cafe & Caffe Pasta on the harbour front. Central location everything in St Ives is easily accessed from the b&b. Best location in the heart of St Ives. Quaint little cottage, very Cornish! Superb breakfast & very friendly landlady & staff who were always willing to share useful local knowledge. Parking space a bonus. Would stay there again. Gorgeous village but tricky to drive round, follow signs for harbour to get in, park & ride best for day trippers. Great shops, art galleries, restaurants & pubs, try Harbour Fish & Chips & the Italian past the Sloop Inn. Sloop sometimes has live music, full of character. Worth exploring far west of Cornwall, Minack theatre is amazing. Loved everything about the Anchorage. We will stay here again for sure if we get to come back to St, Ives. The breakfasts were delicious, beds comfy, room 2 spacious and well equipped. We were completely charmed. Union Inn was our favorite for dinners with local charm - excellent food and fair prices. Shopping is great, many restaurants, fabulous scenery, highly recommend getting A-1 Cars to take you on a tour - so much to see. Stayed several times at the Anchorage and always felt staff go the extra mile to ensure an excellent stay. Super friendly staff made us feel very welcome. Nothing was too much trouble and breakfast was excellent. PERFECT!!! The location of this b&b is perfect, short walk to the harbour and main shopping area. The local Thai restaurant is superb. 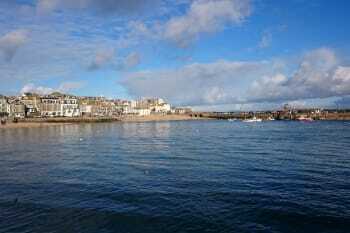 St ives us a fantastic place to visit. Wonderful! loved how original features were preserved. Hospitality and communication second to none - Thank you Sian! The Tate obviously & The Barbra Hepworth Museum on a combined ticket also the St Ives Museum amass with treasure. Great location,pretty little place,lovely room(room 1) with sea view from the attic room!Breakfast great and lovely staff! I would book again!!! Stay here and you can easily get to where you want on foot! Sloop pub nearby does decent bar meals and live music! Very friendly staff Fantastic location Being able to reserve a parking space know Aufuat eas a real bonus!! 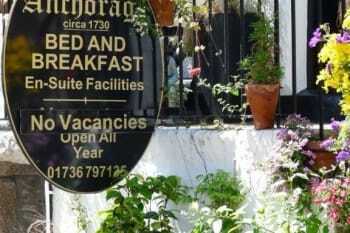 Friendly staff,good central position,a lovely small bed and breakfast ,come and go as you please.It was an excellent stay. Everything on the doorstep.St Ives is very busy and car parking is very limited. 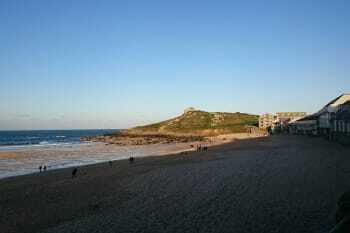 Great location next to the harbour and just a couple of minutes from Porthmeor beach. Comfortable room and a great breakfast.A communal fridge was very useful for storing food and drink during hot weather. Sion and the other staff were all very helpful and friendly. The room could have done with a fan during the hot weather but otherwise no problems. Had a great stay and would definitely come back. Perfect location just a few minutes from the harbour and beaches and 10 minutes walk from the station. Great location, friendly staff. The room and bathroom were lovely. Breakfast was fantastic. Very friendly and informal atmosphere. Quirky and characterful cottage with lovely modern en suite facilities. Breakfast cooked to order.Need to be aware that there is no portering and the stairs are as you would expect in a 300 yr old cottage. We spent our time on the beach. Lovely sand castle-y sand, clear sea water.Ideal for children. Really clean and comfy room. Great breakfast and friendly staff. Would certainly stay again! The Captains Table at the Sloop Inn is a real hidden gem! Superb steaks! Only possible complaint is that in a room for 2 people it is a good idea to have 2 chairs otherwise one person has to sit or lie on the bed which is not always convenient. Very close to lots of restaurants, etc. and to the walk along the sea front. Great location for everything. Bedroom 1 has a terrific harbour view. A bit of TLC needed to the fabric and it would be lovely to see all the flowers outside as there used to be. You can't beat the Sloop front bar for atmosphere and characters. The Porthmeor Beach Cafe Tapas are historic! Thanks for your lovely review. I can confirm the flowers are being planted for the summer! Lovely room, view of beach and sea, very central location. Comfy bed and everything provided. Delicious breakfast too. The owner, Sian, is warm and friendly and made every effort to make our stay enjoyable. Being so central in St Ives it takes only minutes to walk anywhere in the town. The Tate is about 4 mins walk away. The beach about 50 yards . Lots of great cafes and restaurants very close as well as other shops etc. It takes about 8 - 10 mins to walk to the railway or bus station, probably less. Train us a brilliant way to get there, stunning journey by the sea and no hassles with parking. Frequent local buses. Loved the attic room! Very cozy and a view of the ocean. Lovely location, lovely staff and fabulous breakfasts. Stayed with my six year old daughter in room 4 with a private bathroom across the landing and it was lovely and clean and plenty big enough for us both. The only problem my daughter had was opening the bedroom door as the door stuck a bit at the bottom and the door closer made the door quite heavy but she was never on her own so I could do it for her. Wonderful place to stay, really lovely hosts, excellent breakfast. Thank you so much. Our accommodation was absolutely perfect in every way. It couldn't have been bettered & the wonderful breakfasts set us up for the day! There was one small hiccup with the boiler (re water heating) but even that was overcome in a practical & sensible way, so there was no real inconvenience for us. We would also like to thank you for letting us delay picking up our bags on the morning of departure. This property is 100% convenient for absolutely everything. Parking pass is very convenient and stress free . Breakfast excellent. Accommodation room 1 private and quiet, ideal for my needs. Ideally situated for the painting school and all the town facilities. Beach cafe in front of Tate gallery has the best view of any restaurant I have visited on the coast. Reasonably priced good tapas and main menu and excellent service. We were given a very warm welcome and attentive service throughout the weekend. The breakfasts were delicious. Excellent host & staff, really good breakfast. Room 1 could do with bathroom revamp, its looking quite dated, & a larger tv would be nice. 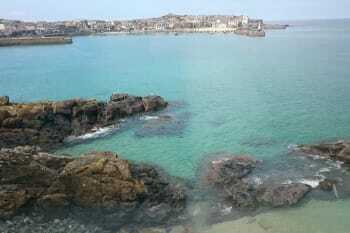 Having said that the views are great & i would stay again if/when I'm back in St Ives. Lovely friendly little B&B. Breakfast was excellent and location ideal. You're ideally positioned for the Tate and the Hepworth here, as well as the harbour and several beautiful beaches. The top room is delightful, but not suitable for taller travellers as I knocked myself on the beams several times. It has a lovely spacious feel to it, however, with a large window and beautiful light. Definitely a room with a view. Very welcoming; excellent breakfast; comfortable room; perfect location. Would definitely come again and would recommend to anybody. Parking a bit of a problem but we managed to get a space each day on the Island car park (£7 for 24-hour ticket) Ate at Café Pasta and Seafood Café - both excellent and good value for money. Sian and her team were friendly, helpful and very welcoming. The room was great with views of the harbour and Smeatons Pier. The location is good for all the shops, restaurants, bars and the harbour is only yards away. We enjoyed our stay very much and were sorry to leave but happy to say we have already booked for New Year 2018/19! - So highly recommended. Lots of restaurants and bars, the food is very good in the Sloop pub, the steaks are excellent. The restaurant Caffe Pasta is also very good (a favorite of ours) and all a short stroll away. There are lots of shops and art galleries including the well known Tate and the Barbra Hepworth Museum. Many coastal walks and much more. Just a great place to be. We so enjoyed our stay and loved the breakfasts! Excellent breakfasts ,very friendly staff. Will definately be back! Clean and pleasant place to stay in a great location near to the harbour. The staff were very friendly and helpfull and the breakasts very good with fruit, cereal and full english and vegetarian alternative. 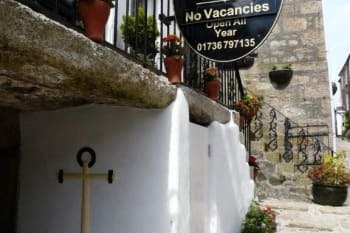 Take a guided walk around historic St Ives and you might also enjoy the evening Ghost Walk. Also visit the St Ives museum. A boat trip to the seal island if you have your sea legs, it can get rough!! St Ives is awash with art galleries and, of course, it has it's own Tate gallery. The beaches are fabulous!! Love St Ives!! Excellent room, nicely furnished, brilliant breakfast and great staff. Ideal for all beaches only 50 metres from Porthminster beach(Harbour area)and Port hmeor( West side) only 300 metres away.Advised not to take a car here, no parking outside due to narrow lane, although a space is available on a first come basis a short distance away I believe. Only 4 rooms but worth it, steep staircase to first floor and low ceiling so beware. However the stay is recommended due to the close proximity of the beaches, local restaurants and amenities. VERY small bed and rooms. Nice place: quit and central. Very good breakfirst. Very good service. We had a lovely stay. The anchorage offers beautifully clean rooms, an amazing breakfast and a lovely friendly greeting each morning. Totally left alone to come and go as we please and located right in the centre of St Ives. What more could anyone ask for. Lots to do and see. St Ives is beautiful even when it's raining. Eating out can be a problem if you prefer healthier food but if fish and chips are your preference then you have a great choice. The pubs can get quite busy but offer a great atmosphere. Lovely place, spotlessly clean, perfect location, friendly hosts. We had an excellent stay at `the Anchorage`. Everything was just perfect. Very delicious and various btreakfast. great friendly and informative staff. We can't think of anything that could have been better. Room was small but the view was fantastic. Breakfast cooked to perfection. Danielle and her team are great, made us feel at home. Don't forget to book parking. Best location, kind and friendly staff. 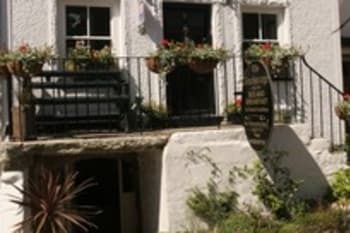 You can access everything and everywhere you can enjoy in St Ives within 5 minutes walk from this B&B. Very friendly welcome. Clean & pleasant accommodation (Room 3) in St Ives. Have stayed before, and will do again! The breakfasts were excellent. Good wifi coverage. Handy for painting school, shops, Tate, Porthgwidden beach. Handy parking in town where parking & driving is very difficult! Local restaurants we would recommend - The Searoom on harbour side; and Porthgwidden beach cafe (both evening meals, both excellent service). The Mermaid Restaurant, whilst the fish (John Dory, sea bass, plaice) was excellent, the decor is a bit more garish, no views, and seating is cramped. Fabulous Accommodation, Great Hospitality, and superb Full English Breakfast. St Ives is a Beautiful Place, with Lots to see and do. Would recommend for sure, and already have done, and hope to be back. 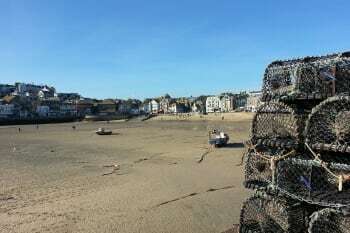 So much to see and do in St Ives, lots of lovely Bistros, Restaurants and Shops. Many places to visit near by, Marizon, Penzance, Mousehole, Lands End, all with easy access by Car. The room was clean and tidy with fresh towels/linen. Staff were accommodating and very friendly. Breakfast was excellent with a range of choices, from cereal, fruit and yoghurt and full english (vegetarian option available). Car parking was also available, which is very useful, especially during the summer months. Prime location just off Fore Street and a stones throw away from the harbour. The historic Sloop Inn is metres away, as are the many harbour side cafes and restaurants. The Anchorage is perfect for the centre of St Ives. Location is perfect. 20 steps from main shopping area and harbour. Facilities are perfect and staff dedicated.My room newly decorated, new en suite and bedroom suite. Great location, lovely b & b . Room 1 has sea view awkward stairs but manageable & small bathroom. Breakfast was delicious. Hosts were wonderful very helpful and eager to ensure we had a great time, which we did. Cafe Pasta great food & not bad prices. The Balcony great bar for watching the football or the harbour. Raijpoot Indian restaurant very good & bring your own booze. Booked a last minute break for 2 nights at the Anchoarge. had a great stay - hospitality and welcome excellent and super breakfasts. Would book again. Do not miss the Barbara Hepworth studio and garden. Had an excellent talkk about her life and career at 1 pm. Repeated daily. Super food at the Porthgwidden beach cafe. Not often something comes along that is perfect, but you've done it! Glad I took you offer as can't often afford the full amount charged. Glad to hear you can take dogs in Room 2. Good luck wirth it all. Being a 6 Foot 5 man, i found the hotel to be a challenge for my size. however this did not stop me from enjoying my stay and led to some extremely pleasant laughs with my partner and staff. others may not appreciate the age and the beauty of the buildings size but I found it to be rewarding and exactly what i wanted from my stay. I had to walk backwards down the stairs and sadly could not stand up straight in the shower but this did not deter me from the warm and friendly feeling that the hotel offered. the breakfast was delicious and the comfort from the hotel was second to none. Thank you for everything, we shall be back and we shall be requesting room 1 again. Perfect Location if you want to explore the harbour. 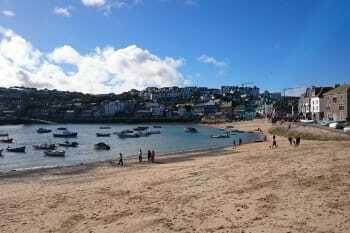 a Stones throw from the Restaurants and Pubs made this the perfect location for us to start exploring what St Ives harbour had to offer. Lovely stay at the Anchorage, felt very relaxed and comfortable, great to have a parking pass too. Bed comfortable and rooms lovely and warm. Breakfast was very good and good quality food well presented. Really enjoyed our stay. Wish you good luck in your next venture whatever that may be. Parking very limited, so request reserved place ( 7 mins walk) early. What can I say. It was amazing. The location was excellent with easy access to the habour and beaches plus restaurants. The room we stayed in was very clean and it had everything we needed with a great view of the sun rise over the habour. The staff were friendly and helpful and the breakfast was definitely worth it. The only minor thing is noise due to the proximity to the habour. In terms of things to do. I would recomend visting the Main Street and a walk around the three beaches. I would also highly recommend Porthmeor beach which has a great cafe to eat and a great view of the beach and surfers. One other place to eat is Porthminister beach cafe which might be pricey but well worth it. Carbis bay is also a nice beach to visit. Quaint little B&B just a few yards from sea front.Cosy comfortable bedroom. Breakfast was really good with choice of cereals fresh fruit and hearty tasty full English. Danielle and Jane were so friendly really homely cheery place to stay.Car had to be parked in a car park a short walk away.St Ives is the most magical place to stay with cobbled streets picture postcard harbour lovely quaint shops and abundance of places to eat.Something for everyone. Minnack Theatre well worth a visit. Very helpful staff, excellent breakfast choice and very clean accommodation. No provision for GF food. Avoid room 3 if possible, it is an attic room with difficult access. Mermaid restaurant is excellent for fish dishes. Multitude of art galleries. Explore and push yourself out of the comfort zone! Loved staying at the Anchorage. Very friendly and welcoming hosts, delicious breakfasts and clean room. Highly recommend painting classes at school of painting. Very nice experience, friendly and beautiful building and interior. Would have liked twin beds instead of double bed - if so, it would have been a straight 5 rating all over. Excellent location. Clean, tidy room, good breakfast, friendly helpful host. My second stay and still as excellent. Will be back for sure. Great personal skills from Danielle and the other lady (sorry, I didn't catch your name...). Great location and good brekkie. Difficult to get to attic room. Don't at anything but Philp's pasties - I did alot of research.. The Upper Deck Bar behind The Sloop is great when it's sunny and they have Moet at £45.! Fabulous location right at the end of the high street and one road up from harbour front. The hostess, Danielle is super friendly and helpful...and the breakfast fantastic. We really enjoyed our stay and felt very welcome. We will come back! And highly recommend The Anchorage to friends and family. So many things to do and restaurants to visit. Too numerous to mention. I cannot fault this establishment. My wife visits more frequently than myself and has nothing but praise in the way she is looked after. Should decide for themselves, during our stay we just relax and amble around the town. Top notch hospitality! Strongly recommended! very polite owner! Lots of nice places to visit (and to eat good food) in the surroundings, even during winter! A very friendly welcome from Danielle who also dealt with my central heating very efficiently when it was giving a little trouble. Wonderful to have a parking slot. Central and easy walking distance for a selection of beaches, shops, galleries and eating places. Great place to stay. Room small but with lovely view to harbour. Very friendly B&B with reserved parking facilities. Close to everything in St Ives. Breakfast are good using local produce. Great place to stay in St Ives. Very friendly and welcoming and the breakfasts are lovely! Very friendly, very thoughtful, super cooked breakfast. Wide choice food and things to do. I would recommend staying at the Ancorage. Future clients should be aware that room 4 is very small and that the bathroom is across the landing . The good thing is that this bathroom is just for the room. Also, they need to be aware the drawback to being in such a central location is the evening noise in the busy months . Personally , I got used to this . All local bars and rest is good , plenty of choice .need to reserve in busy months. Everyone should visit all the beaches and all that is on the Tate card. The best way from the Station to the Anchorage is down to the harbour. You should recommend this to travellers coming by train. We had a smashing week in St, Ives at The Anchorage. We stayed in Room 2 which was spacious and private and was really like staying in mini-apartment. The central location meant we could easily access the great restaurants and beaches whilst being able to pop back regularly to make a drink, use the facilities or have a rest! The breakfasts were delicious and had a good range of options available. Danielle and her fab team made us feel really welcome and relaxed - nothing was too much trouble. Thank you for a lovely holiday. Such a lovely place, very friendly welcome and staff. The breakfast was good, with a wide choice cooked freshly. The location is great, right in the heart of town. You must try and have dinner at the Porthmeor Café, and request a "pod" - an outside table in an alcove with a totally superb view. Great stay , friendly welcome, brilliant location. Just a great location for everything in St Ives. Excellent stay in a quirky artsian bed and breakfast guest house.Good location and accomadation. Near to harbour shops and places to eat. art galleries And beaches . We love the central location and the rooms/facilities are great for us. The Anchorage is small and friendly - not really a place for families with lots of children - which makes it ideal for us as a couple. Friendly and welcoming host, nothing was too much trouble, beautifully decorated room, lovely breakfast with various choices, would definitely recommend a stay here. Rum and crab shack, warm and friendly atmosphere, great staff, fab food especially the whole crab. St Andrews Bistro - exceptional food and service, A must! This is a quaint fishermans cottage, and it's very quirky. It had everything you would need for a short stay. If you're not steady on your feet though, I wouldn't recommend the loft room. Although we loved it, getting into and out of the room via the stairs was entertaining :0). Breakfast was lively and plenty of it. Danielle was lively and very helpful. I would recommend paying for the use of the fairly nearby car park space for the hotel. Dinner at "the Captains Table" above the Sloop Pub nearby, was wonderful. Highly recommend. I was looking for a central, cozy, comfortable and homely place to stay. This ticked all the boxes and more for us. It was a surprise birthday weekend away for my man and he was impressed with everything from the unusual entrance to the room, to the view and the generosity of Danielle's service... We will be back! If you go in January be prepared for many places to be shut but on the upside you get the beach to yourself!!! PS Seagrass's mussels, the Sloops' Arbroath smokies and Seafood Cafe sardines are all competing for the beast meal! Had a great overnight stay, Danielle was very friendly and helpful. The room was lovely and the breakfast superb - great coffee too! The Crab and Rum shack is a friendly and cosy place for a drink or something to eat, amazing view of the harbour, and the rum is fabulous - the staff can help you choose which rum would suit your taste. 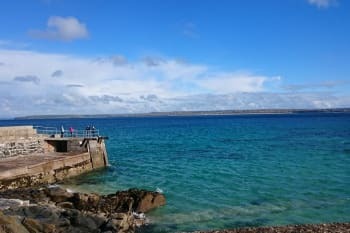 St Ives is unique - beautiful beaches and scenery, lovely individual shops and friendly locals - what more could you want!